Parker Dillman – the “Longhorn Engineer” and a member of my forums, has gotten a custom “remanufacture” of an Atari 2600 working! Way to go! You can visit his site here – hopefully he’ll have this for sale soon! 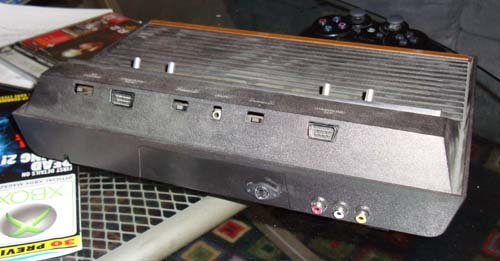 He also has a very nice Atari 2600 composite video mod you should check out. The back of you Atari could look like this! At the Midwest Gaming Classic Parker Dillmann – otherwise known as the “Longhorn Engineer” – gave me a sample of his new Atari video mod. This is a small circuit board he sells that you solder to the TIA chip inside and Atari 2600 to get a great composite/S-video picture. Check out his site here, and continue reading to see me try the mod out for myself. Also, if you need spare Atari 2600 parts, why not check out my awesome auction?